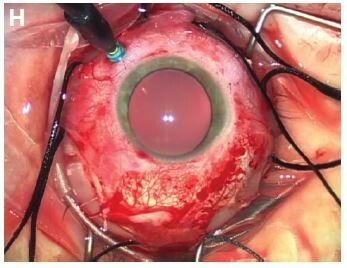 Purpose: To evaluate the surgical outcomes of traditional scleral buckling (TSB) compared to chandelier-assisted scleral buckling (CSB) for rhegmatogenous retinal detachment repair. Patients and methods: A retrospective interventional comparative case series of 49 eyes that underwent SB procedure. Medical records of 27 and 22 eyes that underwent TSB and CSB surgery, respectively, were evaluated. Outcome measures included primary anatomical success, visual acuity (VA), and perioperative complications. Results: Primary reattachment rate was similar with 85.2% in the TCB group and 81.8% in the CSB group (P=1.00); eight patients needed one additional operation or gas injection with a final reattachment rate of 100% at 6 months. Mean VA in the CSB group improved from 20/60 at presentation to 20/35, 6 months postoperatively. In the TSB group, VA improved from 20/80 to 20/45 (P=0.90). Among the eyes that were successfully reattached with either SB approach, two eyes in each group had cataract progression and none of them required surgery during follow-up. No cases of endophthalmitis were observed. Conclusion: CSB is a modified technique with an advantage of superior visualization compared with the traditional surgery, which simplifies the operation, enhance competency, and could be used as a valuable educational tool. It can provide similar anatomical and functional outcomes with no additional perioperative complications.